The Division of Water Quality Management provides technical review for municipalities planning sewer system extensions and wastewater treatment plant expansions. Title 38 MRSA Section 412-B requires the submission of plans for any new drainage systems or any sewage treatment or industrial waste disposal into waters of the State. This review is usually accomplished concurrently with Site Location review or Wastewater Discharge License review. The Department is reaching out to all Maine municipal and quasi-municipal entities to gather information on the state’s wastewater infrastructure via the 2019 Clean Watersheds “Needs Survey” (CWNS). The survey is designed to collect information about known wastewater projects that need to be done within the next 10 years, but have not yet been funded. The survey has been sent electronically to all Publicly Owned Treatment Works (municipal wastewater collection and treatment systems) in the State, requesting that the survey be completed and submitted to Brandy.M.Piers@maine.gov by March 15, 2019. In an effort to optimize the performance of municipal and industrial wastewater treatment facilities, the Maine DEP provides technical assistance services. These services address a number of issues that arise out of the operations. Typically a team will be formed to tackle any issues hampering the facility's operation. This team typically is comprised of a DEP staff person, plant operators and administrators, and may include engineering consultants. This team approach is now used more extensively than in the past, because it builds trust and better working relationships and produces improved results. The team will work together to identify design, administrative, maintenance, and operational performance limiting factors. Once the problem has been properly identified, the team will identify possible solutions. The facility staff's extensive experience with their facility, combined with the DEP's experience with a variety of facilities, combines to form a very effective team. Virtually all of the wastewater treatment facilities in Maine use a combination of biological, chemical and physical processes to remove pollutants from the water. One of the most important jobs of the wastewater treatment facility operator is to control that process to maximize the efficiency of the removal of pollutants. We offer technical assistance to operators in process control troubleshooting, process contral planning and microscopic examination of mixed liquor or biofilm. In 2005, the Maine DEP Staff worked with JETCC and Katahdin Analytical Laboratories to produce a Laboratory QA/QC manual for wastewater treatment plant operators. Most Maine wastewater facility operators used this manual to prepare a Lab QA/QC plan for their facilities. Many Maine wastewater facilities also participate in the annual EPA DMR QA program to test their laboratory skills. Links to a downloadable copy of the DEP Laboratory QA/QC manual and the EPA DMR QA website are available. 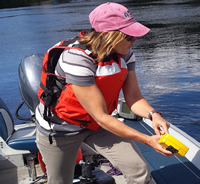 The Maine DEP GIS unit has assembled equipment that can be used to help easily determine the depth of sludge in wastewater treatment lagoons. The equipment includes a depth finder, and Global Positioning System antenna and a data logger that collects the data sent from the other units. We attach the depth finder sensor to the gunwale of a boat and set up the GPS antenna and as we move the boat across the surface of the lagoon, both depth and position reading are collected. Once data have been collected for all of the ponds in a system, our GIS personnel can create a map showing the depth of sludge in the ponds. This can help operators determine if there is a need to remove sludge from one or more of the lagoons in their systems. We have a Turner Designs Model 10 Fluorometer that can be used for determining the actual detention time any process unit in a wastewater treatment plant. We have use the flourometer to study aeration tanks, clarifiers, lagoons, chlorine contact tanks and to determine the time of travel between a treatment plant and the receiving waters. If you are concerned that there may be short circuiting in a treatment unit or want to determine if baffling is needed in a chlorine contact tanks, we can complete a dye study and give you that information. The performance of secondary clarifiers determines the overall performance of activated sludge and fixed film wastewater treatment facilities. Secondary clarifiers must trap and hold the particulate matter after the secondary biological treatment system so that the clean water can be discharged to the environment. We can help operators conduct settleability tests at their facilities and use the data collected to give them tools to use as part of their everyday operations to help insure that their clarifiers perform as efficiently as possible. Document describing the state-point analysis process. Energy is always one of the largest expenses when running a wastewater treatment facility. Pumping water, aerating mixed liquor and dewater sludge require large amounts of electricity, much of it used around the clock every day. We can help operators at treatment facilities determine where their energy is being used and how energy use and costs can be reduced. We will also work with them and Efficiency Maine to find qualified vendors and take advantage of any financial assistance that is available. The wastewater treatment plant, sewers, pump stations and associated facilities are often the most valuable asset in any Maine community. These assets must be managed carefully to insure that the life of the equipment and facilities is maximized and that services is provided at the lowest life-cycle cost. We can help operators understand asset management and use some of the free available tools to develop and implement an asset management program. CUPSS website This free software was developed for EPA with very small systems in mind. CUPSS can be obtained from EPA at the link below. We can help operators set up and implement CUPSS for their systems. TEAMS Website TEAMS is a more sophisticated asset management system. It is probably more useful for larger facilities who can devote more resources to the asset management program As with CUPSS, we can help operators set up and implement TEAMS for their systems. The proper operation of wastewater treatment facilities relies on a reliable, well trained staff. In some cases, it is crucial to know how many people are necessary to properly operate and maintain a treatment facility. We worked with other state and private sector wastewater experts from New England and New York through the New England Interstate Water Pollution Control Commission to develop a guideline for staffing levels at wastewater treatment plants. The guideline can be downloaded from NEIWPCC. We can help operators use the Guideline and an accompanying Excel spreadsheet to determine the appropriate number of staff for their plants. Commercial and Industrial operations may produce process wastewater streams, or discharges into a facility’s conventional wastewater stream, that are difficult or impossible to handle in a conventional wastewater treatment system. For such facilities it is necessary to obtain a permit (or permission) from the appropriate authority before commencing to discharge. Augusta (Greater Augusta Utility District), Bangor, Biddeford, Hartland, Kennebec Sanitary Treatment District (Waterville, et al. ), Lewiston-Auburn (LAWPCA), Portland (Portland Water District), Rockland, Sanford, South Portland, and Westbrook (Portland Water District). In any community served by a local wastewater utility, the facility must receive prior approval from the POTW Superintendent before discharging a process wastewater stream into the collection system. This approval may take the form of a local permit, or it may consist of another form of binding contractual arrangement with the City, Town, or District. The State Pretreatment Program, governed by the Department’s Rule 06-096 CMR Chapter 528, oversees the individual municipal programs. Additionally, it directly regulates a number of Commercial/Industrial facilities in communities that do not have approved Pretreatment Programs, and serves as a technical resource for facilities, POTWs, and communities throughout the state on regulatory and technical matters relating to industrial pretreatment. The Network Discharge Monitoring Report (NetDMR) tool provides web-based technology to record and report treated waste water monitoring data. The operators of Maine’s various public and private wastewater treatment facilities are required to submit Discharge Monitoring Reports (DMRs) to the DEP. The DMR data is required to be submitted electronically to the Environmental Protection Agency. Maine facilities use the NetDMR tool to do this. The NetDMR tool is a secure system. Any user attempting to access the system must provide a valid User ID and password. User ID and password are set up by the user through the NetDMR website. Training on the use of NetDMR can be done online, through your Maine DEP Compliance Inspector, or by contacting the Maine DEP NetDMR contact. In an effort to optimize the performance of municipal and industrial wastewater treatment facilities, the Maine DEP provides Pollution Prevention services to municipal and industrial facilities. Pollution Prevention is the concept of preventing the pollution before it is created in the first place. Typically a team will be formed to identify any opportunities to increase the efficient use of chemicals and energy throughout the treatment facility. In addition, the team will look for any opportunities to reduce pollution either throughout the municipality or the industry. This team typically is comprised of a DEP staff person, plant operators and administrators, and may include engineering consultants. This team approach is now used more extensively than in the past, because it builds trust and better working relationships and produces improved results. The team will work together to identify pollution prevention opportunities. Once the problem has been properly identified, the team will identify possible solutions. The facility staff's extensive experience with their facility, combined with the DEP's experience with a variety of facilities, combines to form a very effective team. State Revolving Loan Fund and DEP Municipal Construction Grants Program.